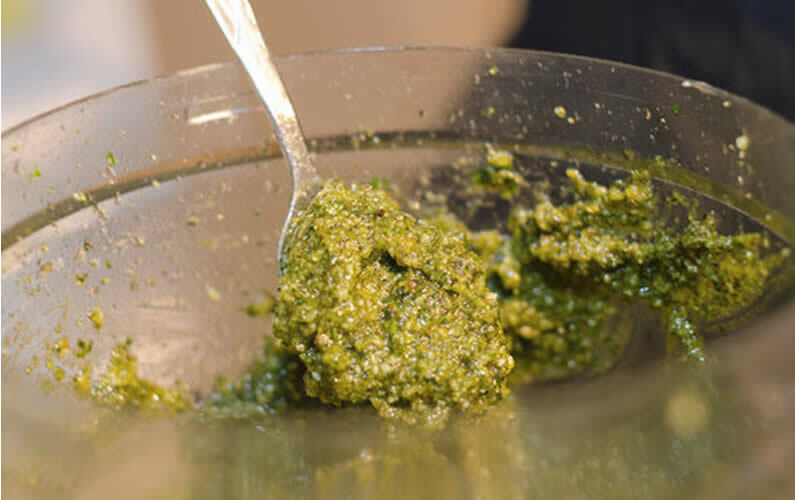 This Omega 3 rich pesto from nutritionist, Lucy Hyland, is a fabulous addition to favourite pasta or rice dishes or can be used as part of a Tapas board. You can also add a tablespoon of this pesto to your oven baked chicken or fish after cooking. Toast the walnuts under a medium hot grill for 2-3 minutes. Set aside and allow to cool. Place all of the ingredients into a food processor and blend well. This pesto is a great addition to your diet if you suffer from dry skin or inflammatory skin conditions such as eczema etc. The Vitamin C, A and antioxidant rich herbs blend really well with the Omega 3 rich walnut and Camelina oil – giving you the perfect balance to nutrients.